The Buckeyes are again away from home, taking on the Nebraska Cornhuskers for the second time this season. Recall that the Buckeyes took care of business at home by 31 immediately before starting their three game slide. The game will start at 7:00 PM Eastern on the Big Ten Network. Stop by and chat with all of your favorite Buckeye bloggers and friends! Go Bucks! 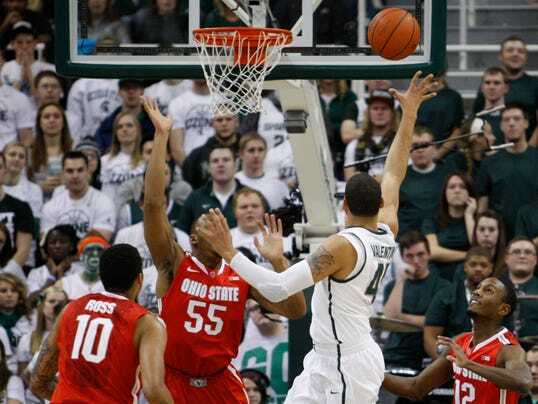 The Buckeyes are at home following their tough, but gritty, overtime loss at Michigan State. Today’s opponent, the much improved Iowa Hawkeyes, who are certainly in the running for a Big Ten title. The game is scheduled to tip at 1:30 PM Eastern. Stop by and chat with all of your favorite Buckeye bloggers and friends! Go Bucks! The Buckeye Shooty Hoopers get their toughest test of the season tonight playing in the frozen arctic tundra of East Lansing, MI. OSU will have their hands full with a very talented and game Sparty team. Come join us as we chat away the battle of the heavyweights, tipping off at 9pm tonight on ESPN! Go Bucks! The Buckeyes welcome the Nebraska Cornhuskers to Columbus for the first OSU home game in the Big Ten this season. Through the first half, the Huskers gave as good as they got, sticking with the Buckeyes before falling apart late in the first half as the Buckeyes claimed a 84-53 victory. The Buckeyes were led in scoring by Amadeo Della Valle, who both scored 15 points on 5/5 shooting, 3/3 from beyond the arc. Joining him in double digits were Marc Loving and Shannon Scott with 13, LaQuinton Ross with 11, and Amir Williams with 10. For Nebraska, Terran Petteway tied ADV in scoring with 15, followed by Leslee Smith with 11. The game started sluggishly for both squads in this early Saturday matchup. Neither team found much easy success against the opponents defense, except when a breakdown occured after a long rebound sequence. Ohio State’s issue, continuing from their game against Purdue, was the inability to buy a basket early, struggling with their shooting from all areas of the court, including free throws. Despite Nebraska missing their big 7-1 boomer in the paint, Sergej Vucetic, due to the flu, the Huskers were not afraid of attacking the paint. They worked hard getting the ball low, and fought hard on the box-outs to earn themselves tough offensive rebounds. By being patient and taking what was available against the gritty OSU defense, Nebraska earned themselves a four point lead before the second TV timeout. It helped Nebraska significantly that the Buckeyes seemed lethargic and uninterested in the game. While the defense was there, it didn’t have the same energy that they usually execute with. This reflected on the offensive end too, with sloppy shooting, and half-hearted motions. Finally, a little bit of intensity on the defensive end flipped Sam Thompson’s offensive switch, spurring him to score four unanswered points – his first in Big Ten play this season.